There are a number of settings in AbanteCart designed to help you customize your shopping cart. The following sections describe the most common settings used in AbanteCart. On the Templates page, click the Edit gear on the bottom of the thumbnail. In the Resource Library window that appears, your logo is shown on the right. Click the Replace File button beneath the logo and follow the prompts to replace the existing logo with the new one. You may need to adjust the logo size, depending on the template you’re using. Specifying SEO-friendly URLs enables URLs to use product names in links to improve SEO performance. Select System –> Settings –> System. On the Settings page, set the Use SEO URL’s setting to ON. Click the Save button at the bottom of the Settings page to save your change. Once you’ve set up SEO-friendly URLs, AbanteCart creates an htaccess.txt file. You’ll need to log into your cPanel and use the File Manager to rename “htaccess.txt” to “.htaccess“. If a .htaccess file already exists, rename it to “htaccess.original” to save it in case something goes wrong before renaming the “htaccess.txt” file. NOTE: The ability to set up SEO-friendly URLs automatically requires that mod_rewrite be configured. If you have problems, please contact HostPapa Support for further assistance. Select System –> Settings –> Store Details. On the Store Details page, enter the new store URL in the Store URL field. You must include the trailing /. 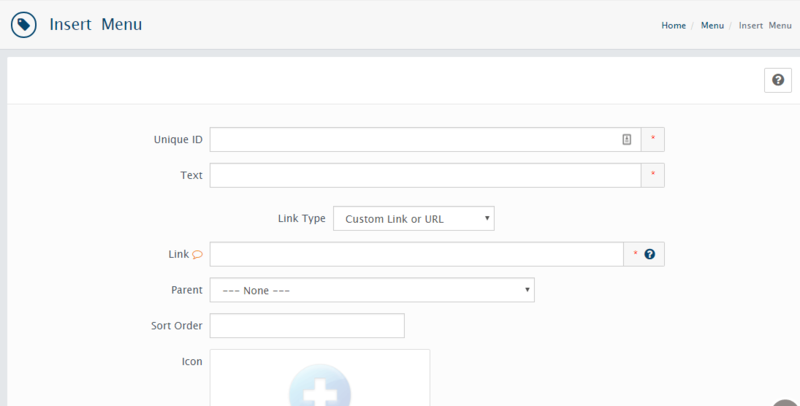 For example, if the new domain for your store is “https://yourhostpapa.com/mystore”, enter it into the Store URL field as “https://yourhostpapa.com/mystore/”. Scroll to the bottom of the Settings page and click Save to save your settings. NOTE: If you previously changed your system .htaccess file, remember to edit it to reflect the URL update. There are many core and third-party extensions for AbanteCart designed to enhance features and provide greater utility for both customers and administrators. To see all extensions currently installed with your version of AbanteCart, select the Extensions –> All Extensions menu. Select Extensions –> All Extensions. Click the Connect button on the Extensions page. In the Connect to the marketplace window that displays, click the I am a new customer button to create a marketplace account, or login with your existing marketplace username and password. Note: If you are creating a new marketplace account, enter the information requested on the Create Account page and follow the instructions. Once logged in to the marketplace, you can browse or search for extensions for your shopping cart. 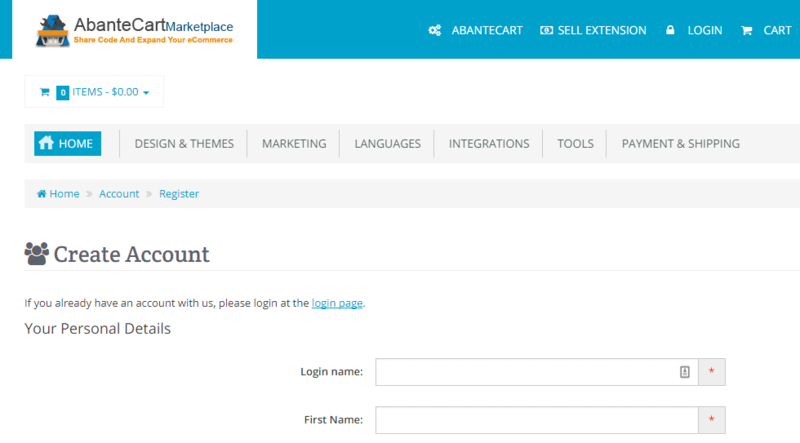 When an extension is added, it remains available in the All Extensions page of your AbanteCart. Locate the extension you wish to install from the Extension Marketplace and install it. In your AbanteCart, select Extensions –> All Extensions. Locate the extension you wish to enable and set the Status button to ON. Your new extension is now available to use. Click the Quick Edit button for the new extension to configure it. Select System > Localization > Language Definitions. On the Language Definitions page, you can customize the text and label formats used in your store, and add new ones as needed. Go to the Language Definitions page and find the text or label you wish to edit. To quickly edit an item, click in the Translation field for it and enter the new text. Click the checkmark next to the field to save your changes. You can also use the Edit button to make additional edits to some labels. If you wish to brand your AbanteCart and remove the Powered By text displayed by default, go to the Extensions Marketplace and install the Whitelabel extension. Once you install and enable it, configure the extension as desired to reflect your branding. Log into your HostPapa cPanel. Go to the File Manager and navigate to your shopping cart install location. In the shopping cart folder, navigate to the storefront > view > default_html5 > template > common directory and edit the footer.tpl file. When done, save your changes. The Powered by text should no longer appear in your store footer. Select the Design –> Content menu. In the Content Manager window, click the Edit icon to edit the policy you wish to change. When done, click the Save button to return to the Content Manager page. You can also add a new page by clicking the + button at the top of the Content Manager page. Use the dropdown menu at the top to select the menu you wish to edit and click GO. Click the + button on the resulting Menu page to add your new menu item. On the Insert Menu page, enter the information for your new menu item. Click Save to save your new menu item. It will now appear in the menu you selected for editing. Edit the settings as desired, then click the Save button to save your changes and update your store. Select Design –> Banner Manager. 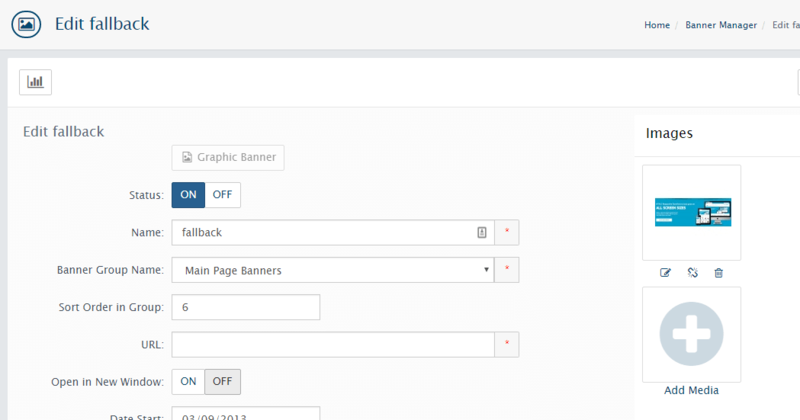 On the Banner Manager page are 5 main graphic banners, and one static (fallback) banner used for mobile displays. To edit the fallback banner for mobile displays, click its Edit icon. On the Edit fallback page, make the changes needed (when replacing the static banner image, use an image that’s 940px wide for best results). When done, click the Save button to save your changes. To edit a main graphic banner, from the Banner Manager page, click the Edit icon for the graphic banner you wish to change. All of the main graphic sliders are text-based. On the Edit Main Banner page for the banner you selected, locate the Banner HTML-code section. Change the img src path to the one to your new image. If you’re uploading a new image, use the Add Media button to upload it. Graphics should be uploaded as .png files with a transparent background. 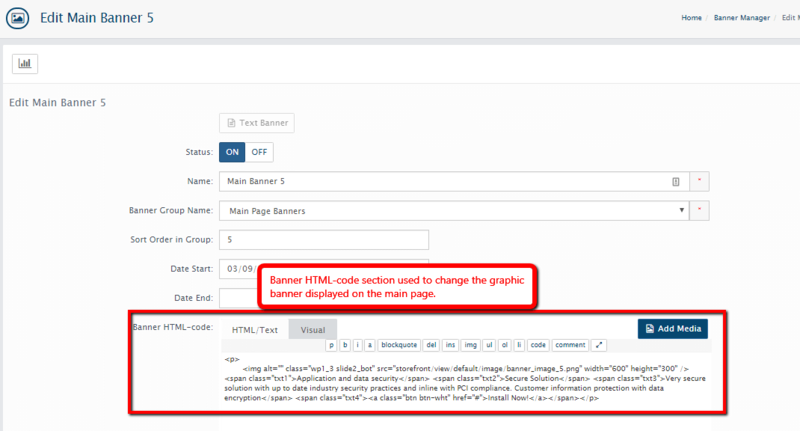 Update the banner text displayed in the <span class=”txt1″> section of the HTML code. Select System –> Settings –> General. Scroll down and locate the Google Analytics account number field. Enter your Google Analytics account number. Click the Save button to update your cart and enable Google Analytics tracking. You must enable one or more payment methods for your store to accept payments from customers. On the Extensions page, you must install each payment option you wish to use. Locate a payment method and click its Install button to install the extension. Click the Edit button for the newly installed payment extension and configure it as needed. Continuing adding and editing payment methods until done. Select System > Localization > Currencies. You can edit the fields for any existing currency. Click the Save icon for that currency when done. On the Currencies page, click the + icon to add a new currency. Enable a currency by setting its status to ON. Disable it by setting status to OFF. To edit the details for any currency, click its Edit icon and enter the necessary changes. Don’t forget to click the Save button when done. For further assistance, please open a support ticket from your HostPapa Dashboard. Follow this link to learn how.